When doing research for recipes that appeal to college students, it is believed that the college student diet consists of ramen and pizza. Though not completely untrue, it is overlooking an under-appreciated staple item that can make anything taste good. Put enough cheese on anything and you are guaranteed that some dummy will be willing to accept your bet in exchange for $5. ProTip: Anything you know how to make—add cheese. Okay so now the good stuff: quesadillas. Not only are they affordable, fast and easy to make, but you can buy in bulk and the ingredients take a long time to go bad. Now I’m sure mostly everyone has had, seen, or dreamt about quesadillas. Here is a basic recipe to master before you try a few ingenious ways to revamp a classic. In a pan skillet large enough to hold one of the tortillas flat, melt ½ of the butter. Fry one side of one of the tortillas, then remove it from the pan. Put the rest of the butter in the pan, then put the unfried tortilla in to cook. Immediately sprinkle the cheese on top of the tortilla in the pan, then top with the previously fried tortilla, browned side up. 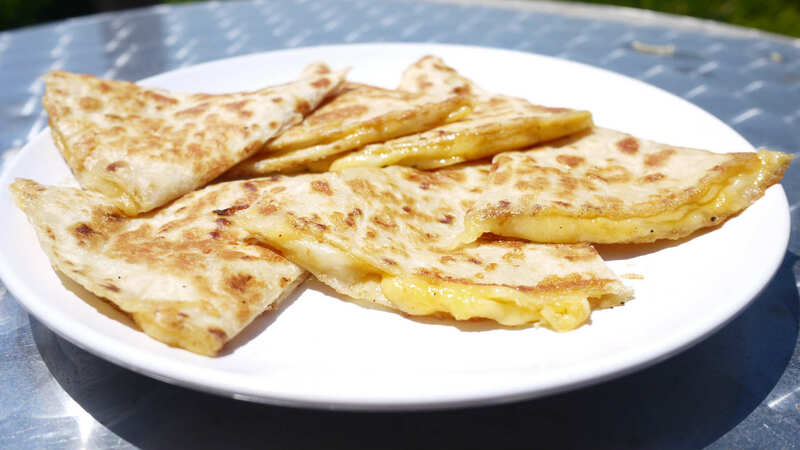 Press them together with a spatula and fry the quesadilla until the cheese is melted. Remove it from the pan and cut in wedges like a pizza. Top with sour cream and/or salsa. What is great about quesadillas is that once you have the basic recipes down, you can start trying different ingredients. What better time to experiment than college? Additional yums—salsa (try different brands and types until you find that one that is just right), sour cream, mole, avocado, and/or more cheese.. hey can’t go wrong. So now we have given you the tools to become master quesadilla makers. Until next time— respect the Cheese.